Likud party issues statement criticizing former Defense Ministers following their remarks against Netanyahu at the Herzliya Conference. 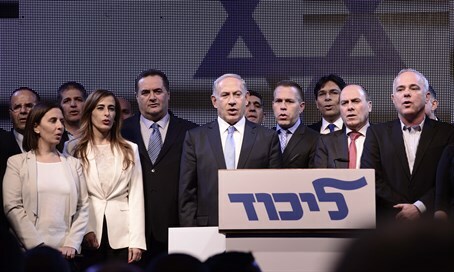 The Likud party on Thursday night blasted former Defense Ministers Ehud Barak and Moshe Ya’alon as “frustrated” following their remarks against Prime Minister Binyamin Netanyahu at the Herzliya Conference. “It turns out that the Herzliya Conference this evening became the primaries for the party of the frustrated in the battle for the savior of the left,” the Likud said in response to the two men’s comments. “Those who found themselves outside the political system now stand behind any microphone that is opened for them and deliver fiery speeches saying exactly the opposite of what they said when they served in their roles – just to get a headline in the media and remain in the public's minds,” it continued. “It’s very strange that these same speakers did not say these things when they served in their positions. It is very odd that both of them praised the Prime Minister and expressed their full confidence in him when they sat in a ministerial chair. An ideology does not change according to the position - but this is not ideology, it is ‘seatology,’” the party mocked Barak and Ya’alon. “The call to get up and overthrow an elected government a year after the people have spoken clearly proves that nothing has changed: It has nothing to do with security, the economy or society. The left simply cannot accept the fact that the Likud is in power. For this purpose all means are acceptable, including harming the security interests of Israel,” the statement charged. “The Israeli government was not abducted, it was elected by the people. It's strange that the same people who believe in the sanctity of democracy do not get it,” concluded the Likud statement.